In early 2009, two satellites – one a defunct Russian military satellite, the other an active commercial communications satellite from the US – slammed into each other 490 miles above the Siberian Peninsula. 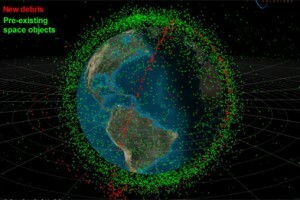 The two satellites hit each other at approximately 26,170 mph, completely destroying both and creating more than 1,000 significant pieces of debris in the process. Space is a perfect example of a public good. Given the vast amount of, well, space out there, space is non-rival (one country’s use of it does not limit the ability of others to use it) and non-excludable (it is nearly impossible to limit access to it). This public nature has been critical to a number of technologies we take for granted today – without free access to space, we would not have the cellphones, GPS navigation systems, or 500-channel satellite TVs we currently enjoy. From the earliest days of the Space Age great care was taken to ensure that space was freely accessible to all and used exclusively for peaceful purposes. The Outer Space Treaty of 1967 declared that space is free for exploration & access for all countries and organizations with the capability to access it. Additionally, it declared that space is not subject to national appropriation under any circumstances or by any means. This has ensured that all regions of outer space are freely accessible and utilizable for any nation, company, or organization with the means to access it. This treaty, and the following 50-plus years of unfettered space exploration and utilization, resulted in an explosion in the international uses of space, from communications to navigation to cutting-edge science. However, the explosion in access to space has had a serious and, in retrospect obvious, side-effect. The modern rocket launch had not changed appreciably from the earliest days of the Apollo and Sputnik programs. Notably, nobody has yet figured out how to have a “clean” rocket launch. The need to deliver a relatively small payload to outer space necessitates the use of staged rocket boosters, with each stage burning its fuel before detaching and falling off to allow the next stage to move a smaller payload higher into orbit. In other words, modern rockets fall apart as they ascend, and they leave a lot of junk in their wake. Importantly, because no one owns space, and access is open to all, there is no governing authority to manage this junk. Free access to space has led to free use of space – and the free discarding of space junk in orbit. The fact is that the continued free use of space has begun to threaten the future free use of space – a textbook case of the Tragedy of the Commons. While we have successfully put more than 1,000 functional satellites, several space stations, and hundreds of manned spacecraft into orbit, we have also put an estimated 21,000 pieces of junk into our skies. Importantly, the amount of junk is growing every day, and may have even reached a critical tipping point, dubbed the “Kessler syndrome,” after which space junk continually collides with itself and creates an ever-growing cloud of debris in certain regions of orbit. Clearly, steps must be taken to both safeguard our existing satellite infrastructure and limit the creation of future space junk. A number of proposals have been floated to accomplish this, with varying degrees of success. A handful of economists, taking cues from such diverse sources as efforts to control overfishing and public land management, have attempted to apply the standard economic remedies to the problem. However, given the “universal access” rule and the position of space as a global commons, it is unlikely that the assignment of property rights or launch quotas will ever be accepted by global players. More feasible are proposals to assess fees on spacecraft launches, which would provide compensation for potential damages caused by jettisoned junk. Andrew Bradley and Lawrence Wein, both of Stanford, have determined that a flat launch fee of $980 per launch would be appropriate and, given the number of launches in a given year, sufficient to pay for the management of debris and any potential damage resulting from a collision with a functioning satellite. The idea is that this fee is added to what is effectively a space debris insurance co-op, which would pay out for any satellites damaged by space debris. As a satellite operator, your fee is added to the pool upon the launch of your satellite, and is paid back to you once you deorbit your satellite at the end of its functional life (to prevent a repeat of the 2009 collision). While the idea is sound, the implementation would be a significant challenge. While $980 per launch may be sufficient to offset future damages, who is going to be responsible for assessing fees and managing the insurance pool? There is no overarching organization managing space. The open access model adopted in exploration has precluded any kind of governing authority from putting the required rules in place to limit the creation and duration of space junk. Even successful space governance models (for example the international standards that “govern” the use of geosynchronous orbit) developed through a messy multi-lateral process, rather than the development of a central set of standards or organizing authority. What is clearly needed is a central mechanism for managing the growing issue of space junk. The problem is too large and complex, and space too public a good, for individual actors to handle themselves. Launch fees are one of many potential solutions, but without some central authority or set of standards to govern the use and management of outer space, space junk is likely to remain a serious problem for decades to come – with potentially serious consequences to the space infrastructure that is so critical to modern life.